Thanks to blogging, I learned about Hay-on-Wye, more specifically thanks to Samantha and her comment on my post ‘Travel and Books, Part 5: Where We Find Them’. We left northern Wales and made our way to Heathrow Airport via Hay-on-Wye, in southeast Wales on the edge of Brecon Beacons National Park. Hay-on-Wye is in Powys County, Wales, on the south side of the River Wye, just over the border from Herefordshire, England. It’s about 175 miles from London. The town’s name comes from the Norman word haie, meaning ‘enclosed place’. The Welsh version, Y Gelli, means ‘grove’. There was settlement in Hay-on-Wye in the 8th century, and the town has its share of castle history, including a 13th century castle destroyed and subsequently restored. Today Hay-on-Wye is a market town with winding streets, an old butter market, and a Victorian clock tower. It’s best known for its 30+ second-hand and antiquarian bookshops and annual literary festival. Normally we know where we’re spending the night when we travel, as I wrote in ‘A Passion for Travel, Part 2: The Master Trip Calendar’. If we don’t have a reservation ahead of time, I start worrying we’ll have to spend a lot of time looking for a motel or B&B, especially when we’re headed to a touristy area on a weekend. One of the best ways to find accommodations in this situation, as many travellers know, is to go directly to the local tourist office, something we usually do anyway. Tourist offices often provide a central accommodations service for a nominal fee. The woman at the Hay-on-Wye Tourist Information Bureau gave us several choices of B&B’s whose owners had rung to let her know they had vacancies. Within minutes, we were confirmed at one, a 5-minute walk from the town centre. The booking fee was £2. We picked up a number of free brochures at the tourist office, including ‘Hay-on-Wye Secondhand and Antiquarian Booksellers, Printsellers & Bookbinders’. Booth’s vision came to fruition, and today Hay-on-Wye gets over 500,000 visitors each year.There’s a bookshop for everyone here, with specialties ranging from Dickens to antique maps to children’s books. Shops are located in places like the castle, the old cinema, and a fire station, with names like The Sensible Bookshop, Outcast Books, Murder and Mayhem, and The Poetry Bookshop. 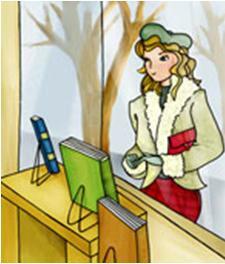 In addition to serving customers in person, many of the bookshops also do business over the Internet. Acknowledging one person’s trash is another’s treasure, I sometimes have difficulty distinguishing ‘antiquarian’ from junk. I know it’s subjective, and there’s the possibility of making a lovely discovery, as we did when we found a first edition of ‘Cheer Up, Little Noddy!’, a 1960 book by children’s author Enid Blyton. Clive introduced me and my son to Noddy and Big-Ears several years ago, finding a gap in our literary education because we hadn’t heard of them before. Famous Five and Secret Seven, yes; Noddy and Big-Ears, no. Noddy and Big-Ears? My son and I thought the names were hilarious. We learned Noddy is a toy and Big-Ears a brownie, an elf-like creature I also hadn’t heard of. They live in Toyland. Admittedly, Noddy looks like a boy and Big-Ears an old man, with his white hair and beard. The first book about them was published in 1949. Since then, various modifications have been made to Blyton’s original stories, to remove golliwogs (subject for another post), and words like ‘gay’ and ‘queer’ used with their original meanings. Along with millions of children in England (and Australia), Clive read the pre-modified Noddy books. He remembers them as typical innocent, entertaining children’s stories of the time. Until we went to Hay-on-Wye, I hadn’t looked through a Noddy and Big-Ears book. I think the characters are adorable, and because of my fond memory of Clive making me and my son laugh so much, we bought the book as a souvenir/collectible. In ‘Travel and Books, Part 4: No Two Bookshops Are the Same’, I wrote about what makes a bookshop great for me. As much as Hay-on-Wye is a booklover’s paradise and we enjoyed exploring its variety of shops, I prefer bookstores with more current publications, whether large chains or small independents. For me these are just as much a source of discovery and treasure as second-hand bookshops. I also realised, as we went into one shop after another, I don’t always feel comfortable in bookshops with narrow, crowded aisles, books piled to the ceiling, and staircases leading up or down to other enclosed spaces. Sometimes I feel like I’m walking through a fire hazard, especially when I’m in an old building and smell the old, old paper. Other times I just feel hemmed in and claustrophobic. I had the same feeling when we went to Shakespeare’s in Paris. There are a few bookshops selling newer books in Hay-on-Wye, but the majority are devoted to older books. Along with their specialty focus, virtually every bookshop also carries hundreds and often thousands of books on other subjects. The only exception we noted was the The Poetry Bookshop, which from what we could tell sells only poetry books. We started our visit to Hay-on-Wye impressed with the man whose original idea spawned this town of books. We left thinking there’s just a little too much self-promotion going on. In addition to owning several bookshops, Hay-on-Wye’s founder initiated a publicity stunt in 1977, declaring independence from the British Isles and proclaiming himself King of Hay. In 2000, he established the Hay House of Lords. Perhaps publicity from these activities keeps tourist numbers high. And perhaps I’d be more positive if we hadn’t had to pay 20p for a half-page write-up by and about this ‘colourful character’ when all the other brochures at the tourist office were free. We think Hay-on-Wye has enough going for it without contrived antics that, for me, anyway, detract from the real commercial heart and natural appeal of the town. Among other activities you can do in Hay-on-Wye are biking, canoeing on the River Wye, and walking. After exploring the bookshops, we were delighted to find one more walk to do in Wales. The day we visited Hay-on-Wye was drizzly on and off, and we thought we’d try to get in a walk before the rain came. This is a short loop around the outskirts of the town, along the River Wye. It gave us an opportunity to stretch our legs one more time, before flying out the next day. There’s something about a river valley and a footpath along the water that makes a walk special for me. We saw a few canoes on the river but had the footpath to ourselves. Unfortunately we just missed theguardian Hay Festival. Over dinner at the Blue Boar pub, we pored over the 82-page festival catalog, picking out author readings and panel discussions we wished we could attend. The New York Times referred to the festival as “the most prestigious literary festival in Britain and one of the most interesting anywhere.” Among many notables who have spoken there are J.K. Rowling, Bill Bryson, and the late John Updike, along with former President Bill Clinton, Tony Blair, and Paul McCartney, who read poetry. This year’s speakers included Edna O’Brien, Alain de Botton, Adam Nicolson, Antonia Fraser, Robert Kennedy, Jr., and Stephen Fry. There were so many sessions we would have liked to attend. During breakfast at the B&B, we met a young Argentinian woman, living in London, with a PhD from Yale, who was spending two weeks in Hay-on-Wye, writing and then attending the festival. Lucky girl. The next Hay Festival is scheduled for 27 May to 6 June, 2010. Travel is nothing if not educational. If we hadn’t visited Hay-on-Wye, we wouldn’t have picked up the tourist office brochure listing twenty-two ‘Booktowns in Europe’, including Bredevoort, Netherlands; Bécherel, France; and Fjaerland, Norway. Nor would we later have discovered there’s an international organisation of book towns, on whose website you can read about these and many others. I loved visiting Hay-on-Wye, notwithstanding Mr. Booth’s self-promotion. Bookshops are its prime attraction, but it also has a beautiful setting on the River Wye, walks and other outdoor activities, and a renowned literary festival. And I love our Noddy and Big-Ears souvenir. Thanks again, Sam, for a wonderful tip. I think it’s fair to say if you love books, you’ll love visiting Hay-on-Wye. We highly recommend Wales as a fantastic destination for individuals and families of all ages. Thank you, everyone who read and/or commented on my posts about this beautiful country. Thank you, Wales, for an amazing visit. We hope to see you again. My next two posts will complete my Passion for Travel series, covering managing personal business while away and coming home. In my previous post, Travel and Books Part 4: No Two Bookshops Are the Same, I described what makes a bookshop great for me, especially when travelling. We’ve been lucky to find some excellent ones along the way. Once we’re into the trip, we read more and more local books (or at least we try to, when not sightseeing or doing other things), as well as brochures, maps, and new information we pick up as we go along. This means some of the books and reading material with which we started out get temporarily set aside. Even the Economist has to take a back seat. Next week we’ll only be in Paris for a few days, en route to the U.S., but it will be hard to pass up a visit to Galignani (independent) and WHSmith (chain) on rue de Rivoli. When we reach the area where my mother lives in New Jersey, it will be equally difficult to avoid the huge Barnes and Noble dangerously located exactly halfway between her former home and new assisted living facility. Sometimes a local book purchase leads to a further story, as on one of my business trips to Seoul. I found a Korean bookshop with a tiny English section, and bought a collection of essays by a local female journalist. The following day, I mentioned to a Korean colleague how much I was enjoying the book, and she said, “She was my university English professor! May I tell her you like her book?” Of course I said yes, and subsequently exchanged several e-mails with the writer. It also became an ongoing point of friendly discussion with my colleague, who followed the writer’s columns and kept me up to date on her activities. On my first trip to England with Clive in 2006, he took me to the Peak District (which is so beautiful, I nicknamed it postcard country). We stayed at a B&B in Bakewell, where we found the amazing Bakewell Bookshop. As often happens, I wished we had hours if not days to explore its treasures. Here I found a sweet memoir, Tales from the Country Matchmaker, by Patricia Warren. Before the days of Internet dating and TV’s “The Farmer Wants a Wife,” she founded the Farmers’ and Country Bureau for rural English clients. More than being a fun read, which it was, it opened my eyes to a way of life I’d never experienced, and what it’s like to live and work in the Peak District. 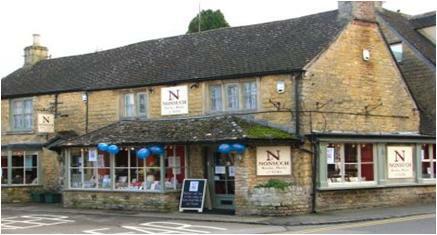 Unique specialty sections reflect individual owner interests at shops like Nonsuch Books in Bourton-on-the-Water, mentioned in the previous post. In its section on Speedway in England, Clive bought his father a book about the history of Ipswich Speedway. Ipswich is in Suffolk County and we hadn’t seen the book in any shops there, but there it was in the Cotswolds, in Gloucestershire County. We didn’t set out to buy a book for Clive’s father, but thanks to this accidental discovery, we did. Books such as the memoir from Bakewell may be possible to locate on the Internet today, but firstly you have to know they exist. If I hadn’t visited Bakewell Books, I wouldn’t have known. We also enjoy browsing at larger independent bookstores. 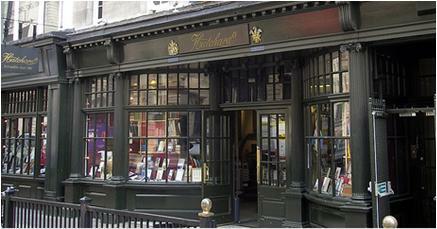 My first visit to Hatchards on Picadilly was only a few years ago, the first time Clive and I went to London together. I had looked high and low in Australia, the U.S., and England for the English version of Bonjour Paresse (Hello Laziness) by Corinne Maier, and thought I’d have to order it online or wait until we got to Paris. Hatchards had it on the shelf. My son graduated from university in the U.S. Midwest this past May, and I will greatly miss the wonderful two-story bookstore on his college campus. Sometime in the future I hope to explore Powell’s Books in Portland, Oregon. I’ve heard great things about it for years, but thus far have had only a tantalizing taste of it at their branch in Portland International Airport. Larger independents might not have the owner visible and sitting quietly in the corner, but each still has its own unique feel and character. What chain stores lack for me, even those with enormous choice and good local sections, are the interesting variations in the character and “look and feel” of independent bookshops. Chains by definition are more uniform in their offerings and presentation, whether the WHSmiths in Europe (where the disturbingly-titled “Tragic Life Stories” section greeted us at their shops in England last year) or the Barnes and Nobles in the U.S. Chains have a more antiseptic feel to me, and don’t offer as much potential for surprise and unexpected discovery as independent bookshops. As much as I prefer the smell and feel of stores selling new books, sometimes it’s fun to explore an antiquarian or second-hand bookshop. There’s one called Treasure Chest Books in Felixstowe, which claims 45,000 volumes and has a huge range on the history of Felixstowe and nearby Ipswich. We’ll no doubt stop in next month when we’re visiting Clive’s family; last year I found an Alan Wainwright book on Scotland there. It always amazes us that in these shops with books piled to the rafters, the owner knows exactly where everything is. 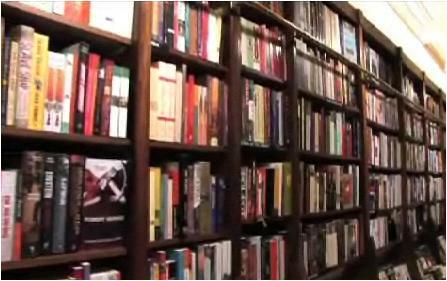 Many B&B owners encourage book trading, and their shelves are also places to find used books. In 2006, Clive read a thick paperback novel and offered it to me when he finished it, saying it was a great read. I declined, so he left it on the shelf of the B&B where we stay when visiting his father. Later I wished I had it, and he said, “Maybe it will still be there next year.” It was. If I had all the time in the world, I’d spend as many days as it took to fully explore Fuzhou Road in Shanghai and Jimbocho, aka Jinbōchō, in the Chiyoda neighbourhood of Tokyo. We’ve only visited each of them once, for much too short a time, and longed to look over their shops and selections of books, prints, maps, and other mysterious paper. Last year we found Shanghai’s Foreign Language Bookstore on Fuzhou Road, but there are many others there begging for a browse. In Jimbocho, we didn’t find any books but tried to purchase a Hokusai print to take home to Sydney. Unfortunately my currency translation was off by a factor of ten, and when we learned the real price, we reluctantly left the print with the shop owner. One of my travel goals is to spend more time in Shanghai and Tokyo, and as part of that to become more familiar with their streets and neighbourhoods filled with bookshops. We do try to allow for space and weight in our checked luggage for book purchases along the way. 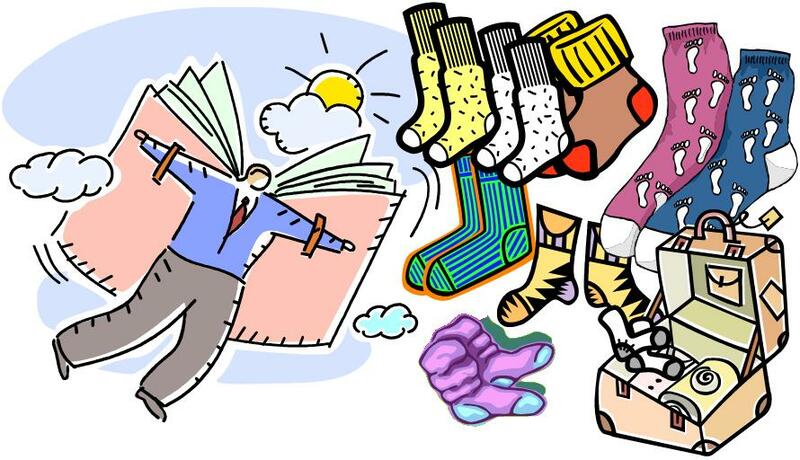 Clive estimates the weight of 1 book = 250 pairs of socks. In the years after I first moved to Australia, I’d return to the U.S. for summer visits, go crazy in bookstores, and mail boxes of books back to Sydney. This was as expensive as having them shipped via amazon.com or amazon.co.uk, and I haven’t done that in a long time. I try to limit my travel purchases to books that are unique and books that will fit in checked luggage coming home. I know my checked luggage isn’t as light as it could be. But for us, books are the ultimate physical souvenir. Clive and I both had a lot of books when we met, and now we’re building a new, joint travel library. We agree that books are valuable not only in their own right, but as cherished remembrances of our travels together. I’ll end this series here. My passion for travel and books continues. Travel and Books Part 1: Will There Be Room for Clothes? One of the joys of travel for me is to find and explore excellent local bookshops. In Travel and Books Part 3: Always Room for Another Book, I wrote about airport bookshops. Purchases there challenge carry-on space. When it comes to exploring local bookshops while travelling, we’ve learned we need to leave space in our checked luggage for the inevitable new batch of books we accumulate along the way. My favourite bookshops are local, independent businesses that sell new and relatively recent books on subjects including local interest, current events, contemporary experiences in travel and memoir, and books that you simply cannot find, or don’t expect to find, anywhere else. It’s often the surprise element that’s the real bonus. After the local independents, I look for chain stores with good local sections, and once in a while, a superb antiquarian or second-hand bookshop. Sometimes we find a B&B bookshelf with interesting choices, or when we’re really lucky – oh bliss! — an entire street or neighbourhood devoted to books. In addition to the bookstores mentioned in My Sydney Paris Life — 15 Things I Love about Sydney and Paris (#12 – Books), I ’ve had the pleasure of discovering a number of wonderful local bookshops whilst travelling. What makes a bookshop great for me starts from the minute you walk in, with respect to its size and number of selections. It’s usually medium-sized, not too small to be cramped and limited in its offerings, not too huge to be impersonal, but just right in being large enough to have a good range of selections. The selections include some bestsellers, but more importantly, excellent local and regional selections. What really distinguishes these shops in my mind is their local sections, which usually include walking guides, cultural information, history, memoirs, and fiction/non-fiction by local authors. You can tell a lot about the owner(s) by the look and feel of the store: the selections on offer, the way the store is laid out with care and creativity, and the sprinkling of bestsellers surrounded by other new books with a highly local flavour or reflecting the owner’s particular interests. The overall atmosphere is fairly quiet, with a distinctively personal feel. The owner is often visible but not interfering, sitting at the register or working in a corner, available for a query or chat if desired but otherwise staying in the background. The owner(s) (and staff, if any) are knowledgeable, and often passionate, about books, whether local, regional, national, or frequently international. They also have valuable knowledge of the area in which they live, which is incredibly useful to the visiting traveller. And to circle back to point #1, this knowledge and love of books is obvious as soon as you walk in, because of the selections on offer and the way they’re laid out. Whether a local independent, chain with a good local section, second-hand shop, B&B shelf, or full street dedicated to books, they all offer the potential for some great travel discoveries, and surprises. I like to get to airports early. Partly this is to get through check-in, passport control, and security without worrying about time. It’s not just getting through that gauntlet, either. Clive and I both have a hot button about being forced to walk through one or more duty-free stores just to get to the departure area and other shops. We have no interest in duty-free, other than getting it behind us and avoiding perfume-squirting salespeople. We head for a place we can have a coffee, send final text messages to our families, and reward ourselves with a pre-flight browse, and usually a purchase or two, at whatever bookstore or newsagent is available. After security In Sydney, NewsLink is where I usually buy a bestselling novel, often from the “Women’s Recommendations” table. I always check the Travel Narrative section to see if there’s anything new, especially related to our destination, and sometimes we have a last-minute impulse to add a small Sydney picture book or Australian children’s book like Ruth Parks’ The Muddle-Headed Wombat as gifts for those we’ll see on our travels. Airports around the world have excellent selections of guidebooks and coffee-table books about their own country and city. Sometimes we’ll make note of a book we’d like to have at home, so we can buy it when we’re back. What I really like is the local section of airport bookshops. They usually extend beyond guidebooks and gift books, and I love browsing the non-fiction shelves for current events, business, and self-help books that might not be available in other countries. When flying from Sydney to New York via the U.S. west coast, we’d rather go via San Francisco than Los Angeles, and one reason is Compass Books. It’s the first bookstore you see upon arrival, and it’s always a treat to see the latest goodies on display. We almost always find something for the flight across the U.S., even if it’s only a newspaper or magazine, and the beginning of a mental list of what we’ll look for later, when not quite so jet-lagged. Clive often picks up one or two computer magazines when we’re in foreign airports, to read product reviews and columns from other countries. And there’s nothing better than finding a little jewel that’s both educational and amusing. This past March, at London Heathrow’s WH Smith, I bought Lonely Planet British Language and Culture, an excellent pocket-guide, especially for someone living with a Brit. My business career and continuing interests are around globalisation in general and being part of the Asia Pacific region in particular. I always look forward to a browse at TimesNewsLink at Changi Airport in Singapore. It has a large Asia section with current non-fiction, fiction, and local guidebooks by writers from across the region, including China and India. We only have a short stopover at Changi Airport on our upcoming trip. I don’t know if we’ll have time to fully explore what’s available, but I know I’ll try. We’ll just have to hope for a longer time there, and in Singapore itself, another time. Then there are the odd or delightful finds. In our early dating days, I told Clive I thought he’d like “84, Charing Cross Road,” by Helene Hanff. Walking through the Beijing airport at the end of a business trip, I passed a rack of dusty paperbacks , including that one. Naturally, it was printed in China. I’d never rule out airports for potential book treasures. But getting outside the airport is the best way to fully satisfy travel-and-books urges. In “Travel and Books Part 1: Will There Be Room for Clothes?” I mentioned what I call Clive’s magnificent trip book. It’s a black folder with plastic insert pages which he increases and decreases as needed. Its contents are always changing, and it’s different for every trip. Clive uses a lot of computer technology to minimise paper. He finds good maps and directions online, copies them to Word, deletes all extraneous information, adds personal notes such as telephone numbers of people we’re visiting, and prints highly-customised pages. I’m always delighted when he produces another of his famous (in my eyes) Word documents. They are useful and colourful, and an incredibly efficient use of space and paper. We purge much of this paper as our trip progresses. We can print again for things we reuse, and we try to save only the best brochures and maps we pick up along the way as souvenirs. I love reading the trip book before we depart and during our travels. Soon we will be leaving for a 3-month journey Getting to Paris: The Long Way. Purchased street maps of Washington, D.C.
British National Trust brochure, “In an artist’s footsteps … Flatford and Constable Country,” which I can’t wait to visit. It’s just over the border of Suffolk, in Essex County. I’m sure he’ll add a few more things before we leave Sydney. Books are one reason why I can’t seem to achieve my goal of travelling with only a laptop and carry-on bag, and why my checked luggage coming home isn’t as light as it could be. When you live in Sydney, you get used to long flights to just about everywhere (except to New Zealand and the rest of Australia – flying from Sydney cross-country to Perth is similar to flying from New York to San Francisco, a relatively short 5 hours). In just over a week, we fly first from Sydney to Singapore, one of the shortest flights from here to Asia, about 8 hours. The next flight, from Singapore to Paris, is about 13 hours. I’m not a big user of in-flight entertainment systems, though sometimes Clive and I start the same movie at exactly the same time, so we can watch it together. (It’s different on United Airlines, which is at least 12 years behind, but that’s another topic.) Neither of us can sleep much on airplanes. Mostly for me, the long flights are a rare opportunity to read for an extended time, without feeling we should be paying bills or cleaning the garage to the point where we could fit our car into it. When getting ready for a trip, one of the more pleasant piles of stuff I put together is reading material to take. This almost always includes recent issues of the New York Times Book Review and Economist magazine, one or two non-fiction books, sometimes a juicy-looking novel, and, if we’re visiting somewhere new, a guidebook or photocopied parts thereof. I always wish I had more time to thoughtfully consider which books to take; I love the process, even if it’s inevitably last-minute. It involves looking over my current ‘to read’ pile, which contains, among other things, a few books still unread after our last trip (sigh), and thinking about which ones would be appropriate for this trip. Decisions are usually based on current events and interests, some of which are global — I’m only just finishing The Elephant and the Dragon, by Robyn Meredith, and am keen to start Fareed Zakaria’s The Post-American World. Sometimes my reading interests are much closer to home. In May, on the flight from Sydney to San Francisco, I read How to Care for Aging Parents, by Virginia Morris and Robert M. Butler. In March, when we were in England and France, we both read Cara Black’s Murder in the Marais, the first of her mystery series set in Paris. I try mostly to take books I don’t want to keep, but of course it’s sometimes impossible to know this ahead of time. That’s one reason I like including a light novel, something I can easily pass on to a friend, or leave or trade at a B&B. Clive and I always plan to read more than we actually do on our trips, and despite knowing this, we still take more than we end up reading. 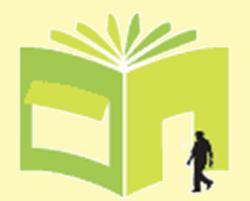 We also leave space in our checked luggage for books accumulated whilst travelling. We both used to take a lot of Aussie souvenirs to family and friends, and these were often books, but we’ve largely stopped that now. Clive always prepares a magnificent trip folder, with all of our travel plans, itineraries, confirmations, maps, e-mails, brochures, and other information we’ve collected, like the name of his father’s favourite Sainsbury’s sherry or where to buy tall women’s jeans (Zara and Top Shop in the UK). For this trip, he’s even included a few articles on the U.S. Electoral College, since we’ll be in the U.S. during the election. I adore looking through the trip folder ahead of time and during our travels, reading the brochures, studying the maps, and learning as we go. The objective is to make the ‘take’ pile small enough to leave room for other things in my carry-on, always a challenge. In the midst of all the usual pre-trip craziness, I’m already looking forward to getting settled in our seats and being airborne, with all that lovely reading time ahead.